The 10kt white gold Bella ring features five dazzling simulated princess-cut stones [2.5mm] and 32 1.7mm round cubic zirconias. 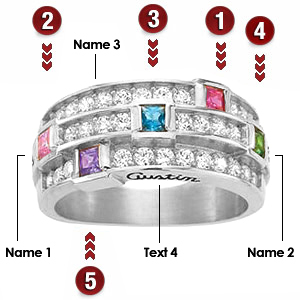 Four engraving areas accommodate up to 12 characters, including spaces and punctuation. Ring measures approx. 8.9mm at top width, 3.75mm at palm width. Import.